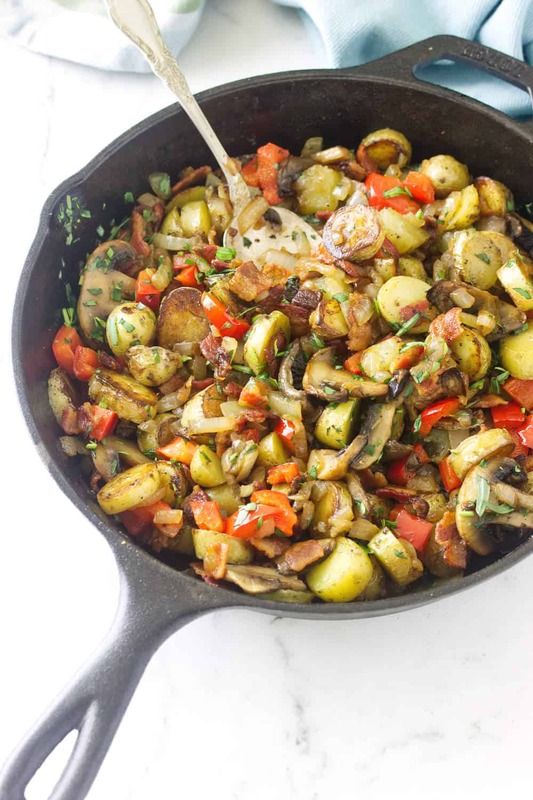 Breakfast Potato Skillet with Bacon and Mushrooms– Yum! Skillet potatoes with crispy bacon bits, mushrooms, assorted veggies and a poached egg. This is a breakfast for a lazy weekday or a Sunday brunch. Skillet potatoes with crispy bacon bits, mushrooms, assorted veggies and a poached egg. 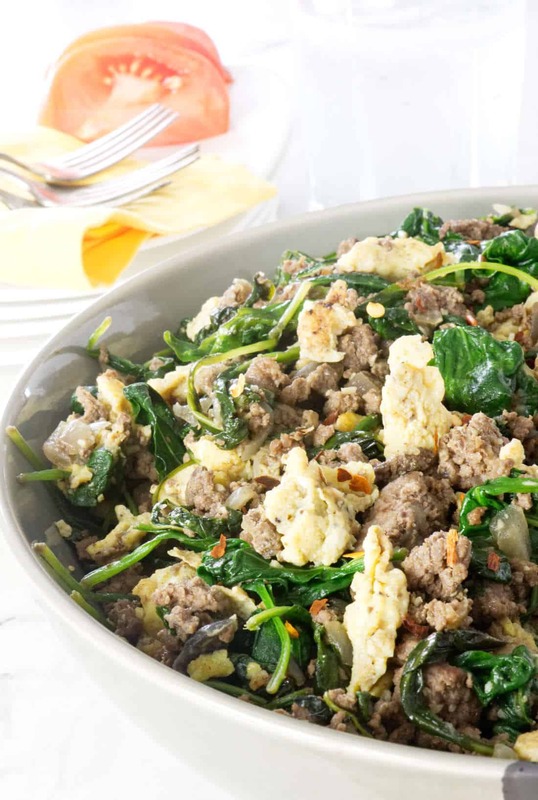 This hearty skillet breakfast is easy, filling and delicious. 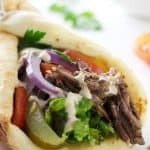 Sure it will take longer to prepare than a quick dish of yogurt and berries. But if your daily breakfast menu has become boring it’s time to ratchet it up a notch. A skillet breakfast is so versatile. Search out your pantry and fridge to see what goodies you already have to toss into the mix. 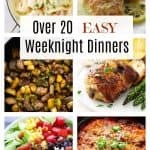 The basics are meat, potatoes and vegetables, plus seasonings and fresh herbs. And always put an egg on top. Or two if you like. 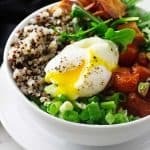 Poached eggs are my all-time favorite way of enjoying this power-packed protein. An omelette, with all the creative possibilities, is a close runner-up. We LOVE bacon! The crisper the better! I drained the bacon on paper towels to remove the excess fat calories. There is a lot of flavor in the bacon drippings. I poured it from the skillet into a small mason jar. Bacon drippings will store in the refrigerator for a long time. 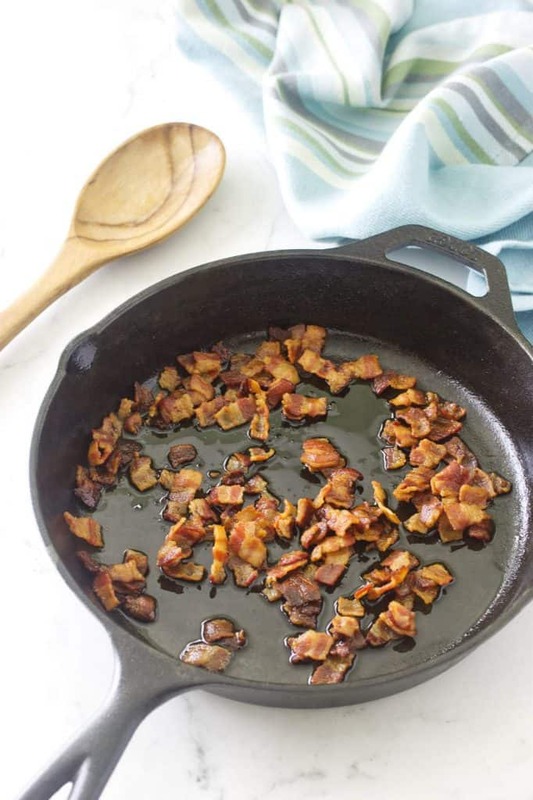 That flavorful bacon fat is a great way to add a power punch to your cooking when needed. I kept our vegetable selection simple. Besides the mushrooms and potatoes, we used an onion and half a red bell pepper. The chopped onion and sliced mushrooms cooked in the same skillet with a bit of that bacon fat. I cooked the red bell peppers to al-dente soft. The veggie mix was transferred to a dish while I cooked the potatoes in that same skillet. I added the potato to the skillet and cooked crisp on one side, flipped and cooked on the second side. When the potatoes were tender the bacon, veggie mix and fresh herbs were tossed together. The eggs in our photos poached for three and one-half minutes. Exactly the way we like them. While they were cooking, I plated the hash. I scooped the poached eggs from the water and perched one on top of each serving. A garnish of more chopped tarragon to each serving was the finishing touch. I chose what I had in the fridge, which was potatoes, mushrooms, onions and bell peppers. The red bell peppers are not spicy hot. They are mild with is a bit of sweetness in flavor. 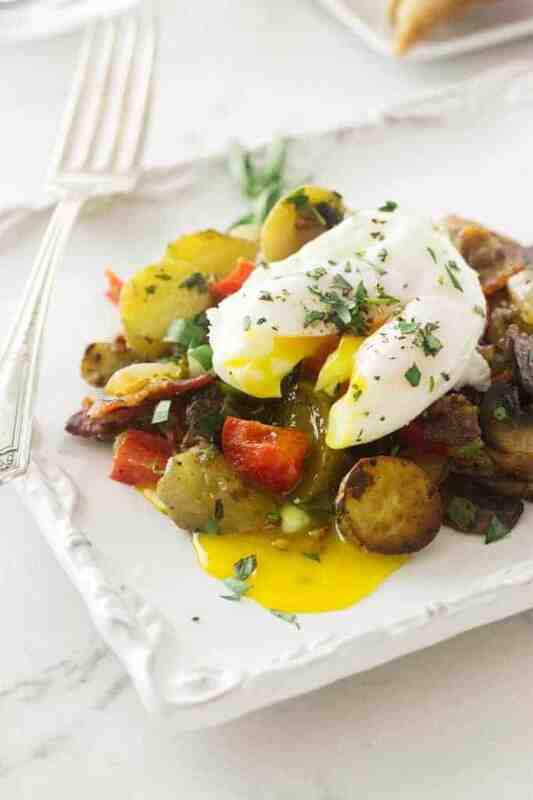 They add a vibrant color to our breakfast potato hash with bacon and mushrooms. Plus, they taste so good in this hash. There is a whole plethora of vegetables to select from. Choose your favorite or go where you have never gone before. Be adventurous! Potatoes will be the bulk of your hash so choose well. Fresh tarragon is one of our favorite herbs to use with eggs. Tarragon is a perennial herb that grows well in a pot on my sunny deck. 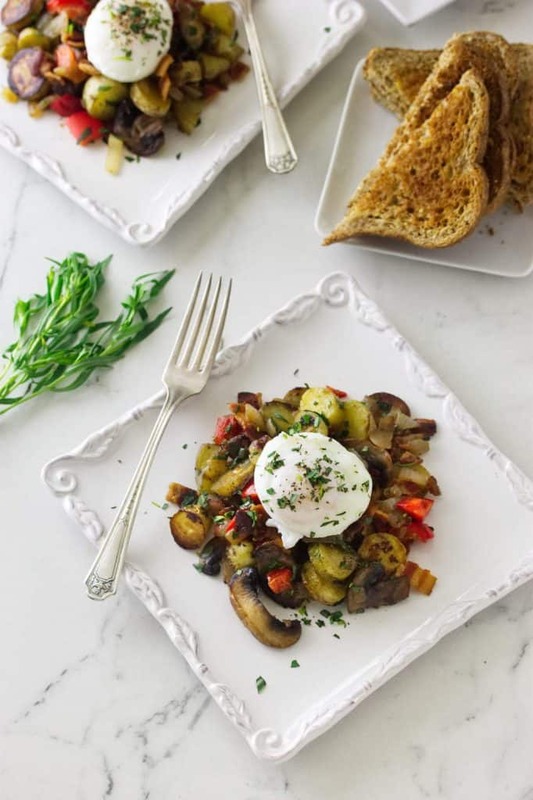 Tarragon has a slight licorice flavor to it and compliments this breakfast potato hash with bacon and mushrooms very nicely. Put a poached egg on that breakfast potato skillet with bacon and mushrooms. Eggs are easy to poach. The most important thing to remember is the water should only be simmering, not boiling. 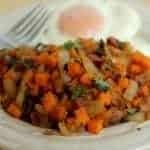 The egg in our breakfast potato hash with bacon and mushrooms is a three and one-half minute egg. Some folks prefer to add vinegar in the water. Others like to swirl the water into a whirlpool and drop the egg in the center. 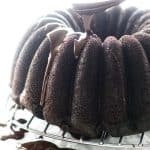 The best method I have learned came from Kenji at Serious Eats. I love his Food Lab cookbook that is full of recipes, ideas, and techniques. 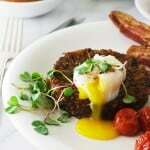 He has a great short instruction video on his post of Foolproof poached eggs. First, you will need a saucepan filled with three to four inches of water. It should be wide enough to accommodate enough eggs that they are not crowded. 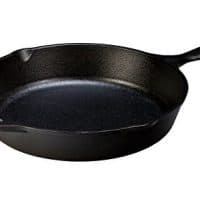 When cooking more than four eggs, I use my cast iron braiser. Heat the water on medium heat then reduce it to low and maintain a simmer. You should see small bubbles beginning to form on the sides and bottom. Next, crack your egg into a fine mesh strainer and swirl it around so the thin, watery substance drains off. You can use the strainer to slip the egg into the poaching water. I prefer to transfer the egg into a small dish or ladle and tip it into the water. When the eggs have cooked to the desired doneness, scoop them out with a slotted spoon. Blot the underside of the spoon with a paper towel to remove the excess water. 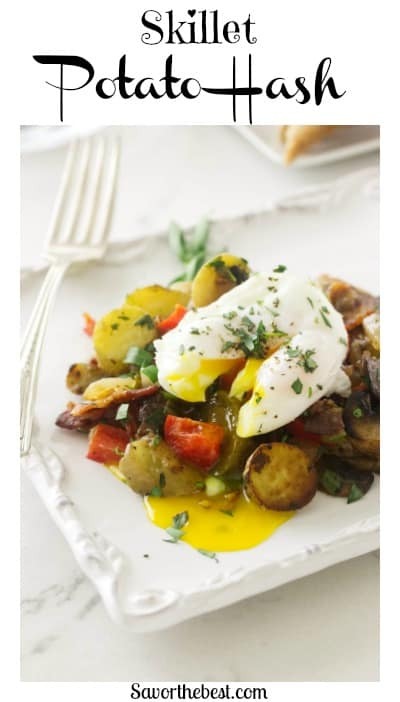 Then the finally!…place a poached egg on each serving of hash with a garnish of more chopped tarragon to each serving as the finishing touch. 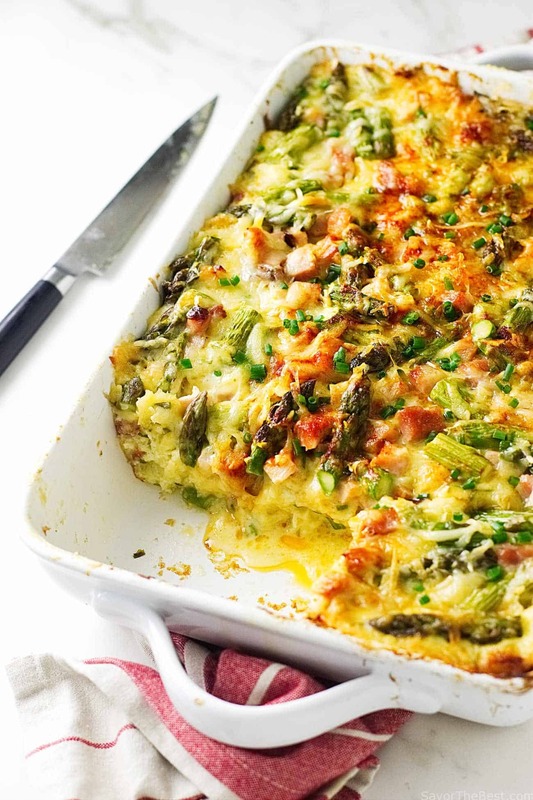 Another great crowd pleaser is this asparagus-ham, and gouda breakfast strata. In a large heavy-bottom skillet set over medium heat, add the bacon pieces and cook until crisp, stirring often. Transfer to a paper-towel lined plate to drain. Using a small dish, pour off all but 2 tablespoons of the accumulated bacon dripping and reserve. Add the chopped onions and mushrooms to the skillet and continue cooking over medium heat until the become onions become translucent. Add the red bell pepper. Cook and stir until the bell pepper is heated through. Transfer the vegetables to a bowl and reserve. 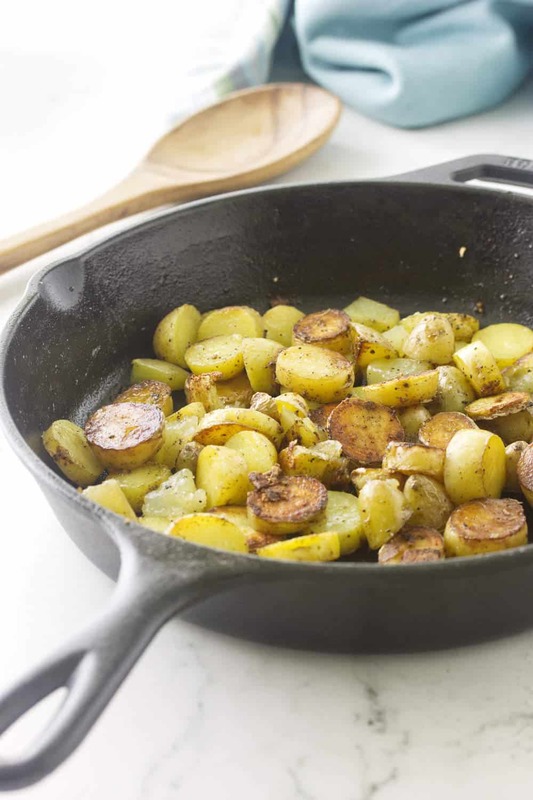 Add 2 tablespoons of the reserved bacon drippings to the skillet, then add the sliced potatoes. Sprinkle the potatoes with salt and pepper and toss together. 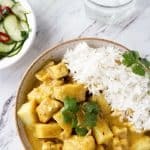 Add 2-3 tablespoons of water to the skillet, cover and cook for 15-20 minutes, stirring half-way through the process until tender and nicely brown. Add the reserved bacon and vegetables to the potatoes and stir to mix well. Toss with the chopped tarragon, reserving 1 tablespoon for final garnishing. Fill a saucepan with 4-inches of water and bring to a boil. Reduce the heat to low and keep the water at a low simmer for poaching the eggs. 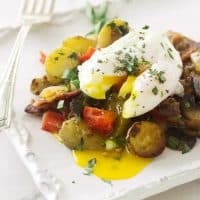 Divide the potato hash equally between four plates, place a poached egg on each serving and garnish with additional chopped tarragon. It is the thin watery liquid in an egg that causes the poaching water to be cloudy and murky. Straining the egg will solve the issue. Remove the eggs with a slotted spoon, blot the underside of the spoon before adding the eggs to each serving. Breakfast Potato Skillet with Bacon and Mushrooms. And a poached egg!